The company known for bringing Android games to your Mac and PC, BlueStacks, announced today that they are now in the hardware business. Introducing GamePop, a new Android-powered game console, capable of bringing 500+ top Android titles to your big screen TV. What makes GamePop different from other Android game consoles is that GamePop comes coupled with a subscription service. For $6.99 a month, users can access any game they choose from the available selection inside the GamePop market place. The console is available for pre-order starting today through the BlueStacks website. Interestingly, when you pre-order the bundled system and subscription, they give you the console and controller for free, but you do have to pay the subscription service at time of checkout. This deal is only available through May, so if GamePop interests you, start doing your research. Currently, there is no word on what the console’s price without the deal is. Is another Android-powered gaming console something we need? Palo Alto, CA May 9, 2013 – Mobile company BlueStacks today announced a new gaming console and subscription service called GamePop. The system includes a custom console and gaming controller free as part of the $6.99 per month service for May pre-orders only. This marks the first time a gaming console has been offered free with a subscription. The company recently passed 10 million users of its App Player software, which allows mobile games to be played on Mac or PC. BlueStacks has also announced content deals today with several top game developers for the new platform, including Glu Mobile, Halfbrick, and OutFit7 – makers of the popular Talking Tom series. “Mobile gamers continue to show higher levels of engagement and longer play sessions on larger form factors,” said Glu CEO, Niccolo de Masi. “BlueStacks and GamePop offer developers like Glu an opportunity to potentially reach a new audience of gamers with great 3D, high-production value content. We see significant potential in BlueStacks’ approach to the console gaming market.” Developers keep all of the in-app purchases that run through their apps with GamePop – BlueStacks does not take any share. Additionally, 50% of GamePop subscription revenue will be shared back with developers, apportioned by usage. 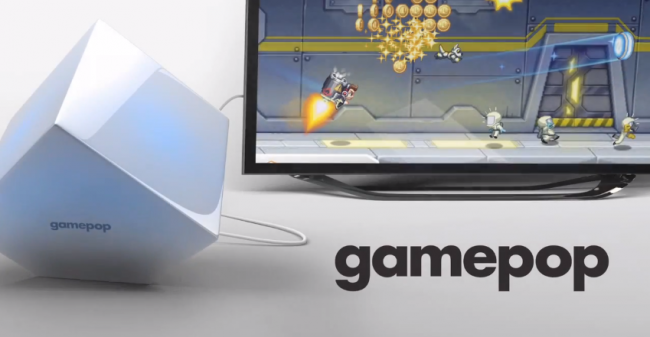 BlueStacks plans to market GamePop subscriptions directly from GamePop.tv, which went live today. Their main site, BlueStacks.com the company announced for the first time today clocks 1.6 million unique visitors every month and growing. GamePop will also be featured on BlueStacks’ Facebook page, where they maintain a community of 1.2 million fans.